My understanding is a AR 15 pistol or AK pistol is not a short barrel rifle as long as it does not have a stock. It was bought that way and paperwork as pistol. So can you carry it in your car as a pistol? Does anybody know? Max3708, proud to be a member of pa2a.org since Dec 2012. 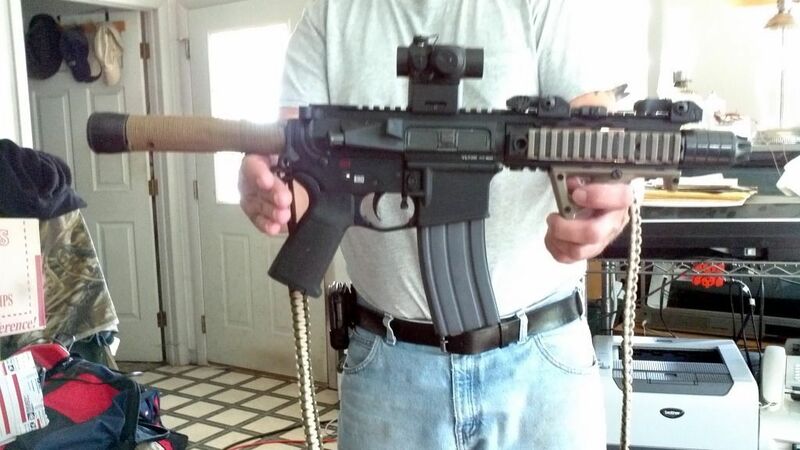 If you have a LTCF, and the AR pistol has a barrel less than 15" - it is considered a "firearm". "Firearms" require a LTCF to carry in a vehicle. If the barrel exceeds 15", it is not a "firearm". ...thus, will have to be carried unloaded, but no LTCF would be needed. So, if it is truly a "firearm", and you have your LTCF - then the answer is yes. Pistol grip only shotguns are the same. If it was sold with a pistol grip and has never had a stock attached, it's not legally a shotgun. It's just a firearm. Hard to tell from the picture, but is that a pistol buffer tube? spblademaker;61097 Wrote: Hard to tell from the picture, but is that a pistol buffer tube? Looks like he took a regular carbine buffer tube and wrapped some paracord around it and finished it off with a rubber end used for walking canes. Prior to me building my AR pistol, I spoke to the ATF's firearm technology branch about the buffer tube and they said that you cannot use something that would be could "readily accept a stock". I asked her to further clarify that and she said that if it can accept a stock then it should be avoided. Just b/c I feel that gives them too much latitude and I don't have the financial means to be a test case for an overzealous prosecutor, I chose to go with the PWS pistol buffer tube which in no way can accept a stock. To me the cord had made it look like a rifle buffer. It was the lump underneath that threw me. the ar and the ar45 builds both have Rock River pistol tubes on them, wrapped with para cord and has a black rubber furniture end on it. the rubber tip is there so it stands up in the safe and it will not accept a stock.